Tips and Tricks | Tilford Air & Heat, Inc. Replacing filter is one of the easiest and most effective methods of conserving energy and saving money of your HVAC usage. Think of it like changing oil in your car, it’s a critical step in maintaining your system’s long-term health. How often should you maintenance your unit? To keep your air conditioner at peak performance, manufacturers recommend at minimum a fall and spring tune-up. You system could last up to twice as long. It’s like getting two air conditioners for the price of one. The annual service you receive as part of a PM Customer could double the remaining life of your air conditioner. Your saving on utility bills could easily pay for the annual service. Plus, conserving energy is important for our planet. Planned Maintenance helps reduce breakdowns and PM Customers receive a reduced service call fee with no overtime fees for nights or weekends, and a 10% discount on repairs. As a PM Customer you will enjoy special privileges. If you ever need service, you receive priority service scheduling – meaning we will put you as soon as possible (geographically). Refrigerant charge. The right amount of refrigerant in your central air conditioner will make your system more efficient, decreasing energy costs and increasing equipment life. Condenser coil (and clean if needed). Electrical cabinet (and brush out if needed), electrical connections & wires. All caps and valves for seals and/or proper fit. Thermostat operation & mounting. The correct thermostat settings ensure that the cooling system not only keeps you comfortable when you are home, but also save energy while you are away. Heat strip amps, circuit components, and safeties. Evaporator coil (condition and clean in place if needed). 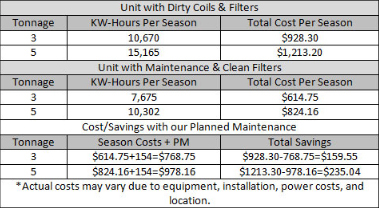 Clean evaporator coils ensure the systems efficiency and energy costs. Blower wheel (and clean if needed). Cleaned and correctly adjusted blower components provide proper system airflow for greater comfort. Airflow problems can reduce your system’s efficiency by as much as 15%. Temperature splits. The difference between the temperature of the air going into an air conditioner and the temperature of the air coming out. An acceptable range is 14°F – 24°F, with 18°F – 20°F being ideal. Lubrication. All moving parts must have proper lubrication. Parts without proper lubrication cause friction in motors and increase the amount of electricity used. Flush & vacuum drain line/pan (condition and clean if needed). The condensate drain in your central air conditioner, furnace and/or heat pump (when in cooling mode) should be regularly inspected. A clogged drain can cause water damage and affect indoor humidity levels, as well as cause your system to stop operating. System Controls. Checking control functions ensures that the system is safe to use and that the operation cycles properly from turn-on to shut-off. Buying a bigger air conditioner won’t necessarily make you feel more comfortable during the hot summer months. In fact, a unit that’s too big for the area it is supposed to cool will cool less efficiently and less effectively than a smaller, properly sized unit. The reason: an oversized unit will cool the room(s) to the thermostat set-point before proper dehumidification occurs; making the area fell “clammy” and uncomfortable. Central A/C’s need to be sized and installed by professionals. Explore our Lennox systems by clicking here. If you have a central air system in your home, set the fan to shut off at the same time as the compressor, which is usually done by setting the “auto” mode on the fan setting. In other words, don’t use the system’s central fan to provide air circulation – use circulating fans in individual rooms. Set your thermostat at as high a temperature as comfortably possible in the summer, and ensure humidity control if needed. 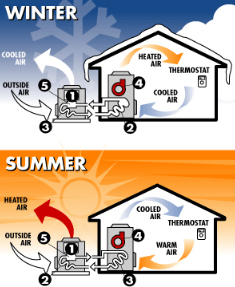 The smaller the difference between the indoor and outdoor temperature, the lower your overall cooling bill will be. Avoid setting your thermostat at a colder setting than normal when you turn on your air conditioner. It will not cool your home any faster and could result in excessive cooling, and therefore, unnecessary expenses. Avoid placing appliances that give off heat (such as lamps or TVs) near a thermostat. Ensure that any vents located near the thermostat are directed away from thermostat. During summer, keep the window coverings closed during the day to help block the sun’s heat. Heating and cooling your home uses more energy and costs more money than any other system in your home – typically making up about 48% of your utility bill. No matter what kind of heating and cooling system you have in your house, you can save money and increase your comfort by properly maintaining and upgrading your equipment. By combining proper equipment maintenance and upgrades with recommended insulation, air sealing, and thermostat settings, you can save about 30% on your energy bill while reducing environmental emissions. Set your programmable thermostat at as low as comfortably possible in the winter, and as high as comfortable possible in the summer; and – depending on the season – raise or lower the set point when you’re sleeping or away from home. Clean or replace filters once month or as recommended, but defiantly check your filter every 30 days to ensure cleanliness. During the winter, keep the window coverings open during the day to allow the sunlight to enter your home and closed at night to reduce the chill you may feel from cold windows.